Today, we will be talking about BitMEX and how awesome their website is when it comes to trading. There are a lot of people out there today that probably know and have heard about the website but do not know exactly the potential or services they offer that keep registered traders coming back for more! Did you know that BitMEX handles more than $3 Billion dollars worth of BTC per day? That’s roughly about 520,000 BTC; you do the math. The website is probably (if not) one of the best exchange websites today in the market that offers an amazing array of features that every trader would appreciate having. Stop Limit / Stop Market– A stop-loss order allows you set up a price within the range that you are only willing to lose. This works as a safety net for an order that you do not want to end up hitting the ground. Trailing Stop – This order type is pretty similar to the stop market order where the trader specifies the trailing value and once triggered the market order is placed. Take Profit – Works like a stop loss order but works on both ways. Instead of just using as a safety net, take profit orders can also work as an entry position in the market. Post Only – This order setting is an important one because it allows traders to influence the fees they have to pay for the trade. Post only ensures that you get the maker fee and don’t have to pay the taker fees. OCO – One Cancels The Other order does as the name implies – the setting ensures that as soon as one of your orders gets filled, the other one will be canceled in case this is something your trading strategy requires. Now that we’ve got that out of our way, let’s move forward and discuss everything you need to know about the website. Earlier we’ve talked about new traders that are just getting into the game. But what does the website have in store for pro traders? If you are a pro trader seeking the best Bitcoin margin trading place, then you would want to trade at BitMEX.com due to their low fees. For perpetual contracts, the website only charges their traders (BTC) 0.0750% for Taker Fee and -0.0250% for the Maker Fee. The latter means that you are actually getting money in the role of the maker. The taker fees are low unless you use high leverage, this will change the calculation dramatically since the fees will get multiplied with the amount of leverage. That’s something you should take into account. Traditional features also go with the numbers mentioned earlier. To read more about their fees, please click this link. In addition, their website offers a good number of order types to choose from along with a very friendly trading platform which is accompanied by a smooth website. To summarize the advantages we have listed them below for future reference. If we were to explain how margin trading works generally then we would say that you only need to focus on long and short trades. If traders go with long trades then they are buying low and selling high; which is probably the most basic move that a trader needs to do in order to profit from the transactions. It doesn’t require a genius to figure this out and even new traders know about how to buy low and sell high. When talking about short trades, we are just actually reversing the process of long orders. With short trades, traders need to sell the asset for a higher price and after that’s placed they buy low and repeat the process over again. Both of these trading moves if done right the trader will keep the difference as profit, in other words, in both ways traders can make money. Now that’s just the most basic approach when it comes to margin trading. We do need to remind new traders that leverage/margin trading isn’t always something that you thought it was. It’s not some white horse that will help you out of your bad luck streak; it is actually something you should be very careful with. Margin/Leverage trading actually means that you will be loaning money from the platform that provides margin services. For BitMEX their maximum leverage for BTC trading is 100:1 which is one of the highest provided today. Fees – How does BitMEX make Money? Of course, the company needs to make money right? 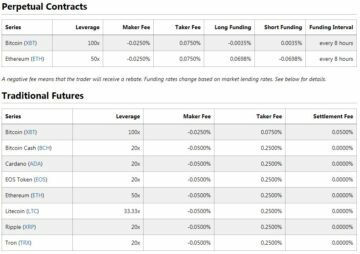 Above is a screenshot of the fee schedule at BitMEX.com. To access the full list, visit the platform. 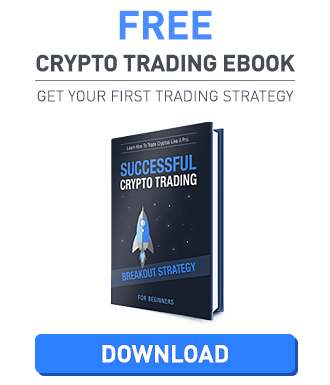 How exactly does BTC Trading work on BitMEX? BitMEX.com is a derivative exchange which means that there are contracts trading which is similar to CFD trading, however, the trader profits in BTC; thus the trader needs to deposit real BTC into their accounts in order to participate in the trades being done on the website. Below we will be talking about perpetual contracts, futures, what they are exactly and what are the differences between these two trading strategies. We will also be giving you guys trading terms that will come in handy. 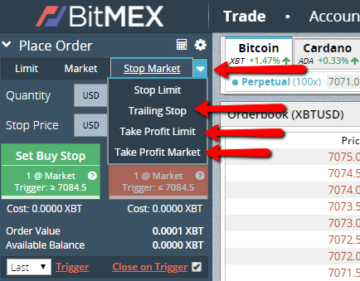 On BitMEX you want to choose the Perpetual contracts for usual Bitcoin margin trading. A Perpetual Swap Contract is considered a derivative product that is very similar to a futures contract. However they do have some significant differences. Other than a futures contract, a perpetual contract has no expiry or settlement; thus it is called “perpetual” meaning it has no end. Another point that you might want to consider is the fact that perpetual contracts mimic a margin-based spot market where the trade is referenced from the Index Price. A derivative product which is an agreement between the trader and the trading platform wherein the trader buys or sells a commodity/currency for a specified price and time in the future. 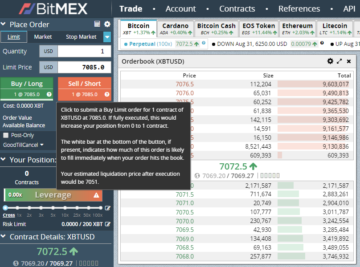 This can go either physically settled or with cash; BitMEX.com offers a good number of trading products in the form of futures with cash settlements. Before you finalizes your trade, you need to calculate the position you are at. You need to be a hundred percent sure that you will be going that direction and that at the end of that finish line you will profit from your decision. You do need to know what you are putting in the line, the entry point and how much you are willing to lose in the process in case something goes out of the plan. To calculate your position size all you need to do is divide your risk amount by the distance of the stop loss order. Of course, if everything goes out of plan you need to calculate the liquidation price of the order before opening a new position. You need to ensure that your market stop loss kicks in before your positions get liquidated. What’s amazing about the website (BitMEX) that we are talking about today is that they do have a tool that can easily help us with this problem. This can be accessed through the left-hand side panel of the exchange platform. This is pretty much basic when it comes to crypto-exchange trading. But how do you open a position in the market? Traders can use limit, market or automated stop limit order (trigger order) to open up a position. On the other hand, to close a position these orders mentioned above can also be placed to close a position. Thus, people that want to close a position can use limit, market, and automated take profit order positions. In addition, in order to open a position in the market, you do not need to use margin trading. Enumerated above is the detailed process of trading written down to a tee. If you are new in trading you need to practice the process holistically to have any weight in the trading world. First, you need to find a commodity, asset or something valuable to trade that you think you might profit from. Once that has been choosing, choose the entry points, plan your loss and the target profit you want to achieve. After that has been done, you need to calculate your position size (which was mentioned earlier) before entering any trade agreements. Once you enter the trade, always make sure that you manage it and try to look for exit points even if everything is doing well. After you have reached your target, exit the trade and count your profits! If your trade setup is at 50:50, you need to have a risk:reward ratio better than 1:1. This means that in order to profit (which counts as a successful trade) you need to have profit every other trade. That is why the risk: reward ratio must always be known before any trade should be finalized. The point is: The stop loss needs to be always closer than the target. One common fatal mistake made by newbie leverage traders is making use of too high leverage. In reality, the higher the leverage is, the higher the difficulty of you getting out a profit after the fees are taken out. We strongly advise new traders to start with lower margin trades before walking with the big boys. Always put in mind that high leverage is gambling (which is not a logical way to trade) and the more leverage you use, the closer it gets to liquidation process. Leverage, just as it was designed should only be used to pump up your funds in certain trade setups and not for a long-term strategy. With high leverage, you might win the battle once but you will definitely not win the war. To sum it all up, BitMEX.com is a website that was designed to cater to professional traders that know what they are doing when it comes to leveraged trading. Newer traders are of course, welcome to try out their services but are more likely to have difficulties due to the level of skills required to harness the full potential of the website. Overall, it is a very awesome website that provides everything you need for a successful margin trade to go through. What do you think about the website? Please do let us know on the comment section below!